Question 1: I have sent a proposal regarding improvement of working conditions in a production plant I visited three years ago. I hope it will be given consideration. Thank you for your valuable suggestion. We will give your proposal due consideration. Periodically we conduct inspections and maintenance services on the plant infrastructure including the major facilities and air conditioning systems. Question 2: In the interests of shareholders amongst other purposes, may I suggest you hold a general meeting of shareholders in a better location, such as a downtown hotel going forward? Thank you for your valuable suggestion. We will give it due consideration. 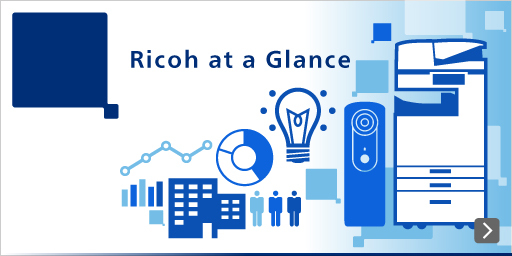 Question 3: Ricoh achieved both its sales and net income targets for FY2012 announced at the previous general meeting of shareholders. Meanwhile, we have seen a significant depreciation of the yen against major currencies since the beginning of this year. In consideration to this, I think the Company’s business results for FY2012 should have been significantly better than they were. I would like you to explain in detail how much the weaker yen contributed to the profit increase for the year. Indeed, the yen weakened in the latter half of the fiscal year, but the average value for the full year was ¥83 against the U.S. dollar and ¥107 against the euro. This means that the relative impact on profit of exchange rate fluctuations for the year to that of last year was zero. Nonetheless, we are committed to reporting respectable business results to meet your expectations. Question 4: I think that you should continue making effective use of your own buildings for the general meeting of shareholders. We appreciate your suggestion, as well as the earlier one with an opposing view. We will take due consideration of the number in attendance, convenience of shareholders and other factors comprehensively when deciding the location of the next and subsequent general meetings of shareholders. Question 5: I highly appreciate the Company’s acquisition of PENTAX. However, in view of the original brand value of the Company, I strongly suggest the continuation of the production of Ricoh brand compact cameras. Thank you for your valuable suggestion. We will give it due consideration. Regarding the camera business, we are planning to enhance the product lineup by focusing the PENTAX brand on the production of single-lens reflex cameras and the Ricoh brand on the production of the great majority of high-end compact cameras. Question 6: With regard to the lawsuit over employee relocations, please provide your outlook on the future judgment of the Tokyo District Court. We regret that we cannot comment on it, as it is about an ongoing court case. We can only say that we will continue to deal with this matter in good faith. Question 7: Relating to the lawsuit over employee relocations, I would like you to disclose information concerning the agency and legal fees the Company have paid. As is the case with the previous question, we regret that we cannot comment on it, as it concerns an ongoing court case. We believe that the general meeting of shareholders is not to debate individual issues but for discussion on the interests of all the shareholders. Question 8: Please provide your business continuity plans for the anticipated Tonankai earthquake. I am particularly worried about its impact on the Numazu Plant. We have formulated business continuity plans providing not only for the Tonankai earthquake but for every possible major disaster that occurs in Japan. Our tests on the assumed impact of tsunamis caused by the Tonankai earthquake has verified that the Numazu Plant where we produce toners is not expected to face serious damage from the disaster. In addition, to provide for the possible impact of the earthquake itself, we have undertaken reinforcement work and other measures on the Plant. Further, our toners are produced at other plants in Japan and overseas with the view to mitigating the risk of earthquakes. Question 9: Is the termination of imaging equipment production at the Gotemba Plant a part of your business continuity plan? No, the decision is not part of our business continuity plan. We are establishing our production structure on a global basis. We decided to terminate the production of imaging equipment at the Gotemba Plant as a result of the initiative to optimize our production structure in Japan. Question 10: The FY2011 Securities Report stated that the Company did not recognize the presence of a labor union. However, there is an organization called Ricoh Union. Is that not a misstatement? We do not think that the statement in question has any impact on investment decisions of investors. However, we will take necessary action with regard to the revision of our Securities Report.